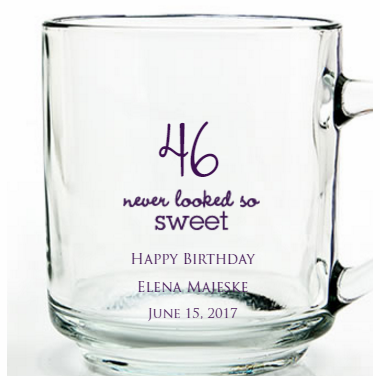 What a great way to remember a birthday with these clear glass personalized birthday mugs favors. Use this birthday coffee mug for both hot and cold beverages. 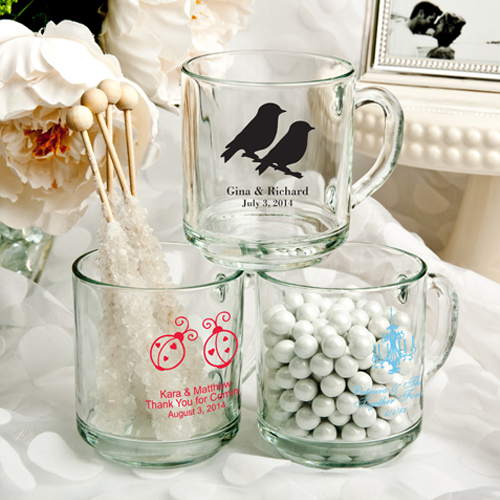 Holding trinkets, candy and other items make this birthday mug a useful keepsake instead of one that will collect dust. Each favor measures 3 1/2" tall x 4" in diameter, with a 10 ounce capacity, in a classic coffee mug shape with a sturdy glass handle for an easy grip. Made in the USA, each is made of clear glass and they're silk screened with amazing accuracy directly on the glass in a wide variety of designs. 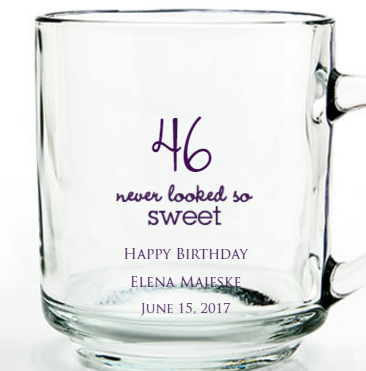 We offer graphics for 21st, 30th, 40th, 50th, 60th, 70th birthday mugs. You can personalize the design with any age, though.